Tim loves his pet dog, Tuffy, and Tuffy adores his boy. Tim also happens to be an berfan of the TV superhero Ultra Dog: he watches the shows, reads the books, plays the video games, wears the cape, and even sports Ultra Dog underwear. Despite cajoling from the neighboring cat, Tuffy has absolutely no fear that Ultra Dog is stealing his boy. Ultra Dog is too famous to want a regular boy...right? Just in case, Tuffy tries extra hard to be super obedient and to outdo Ultra Dog with his love for Tim. But when Tuffy hears about Tim's upcoming trip to Ultra Land, the faithful pup is officially afraid of losing his boy. What's a dog to do? Fight back, of course Tuffy enacts a plan to beat Ultra Dog once and for all, and the reward is unexpected--but awesome. 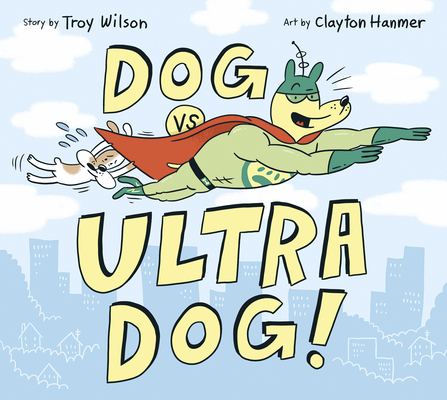 Packed with comics-style storytelling, visual cues, and action, this is a great pick for reluctant readers, dog lovers, and superhero fans alike.